My curiosity regarding serial killers began during my second semester at Marian College in 2004. I was taking a speech class and we all were given an assignment where we were to present an informational speech. I had recently read an article on a serial killer who had been captured in Asia that had both chilled and fascinated me. So, without much thought as to what I might discover, I signed up to research and present a speech on serial killers. I began my research on serial killers on www.crimelibrary.com. The website had an entire section just for serial killers and I went through page after page reading about the horrible deeds these people committed. 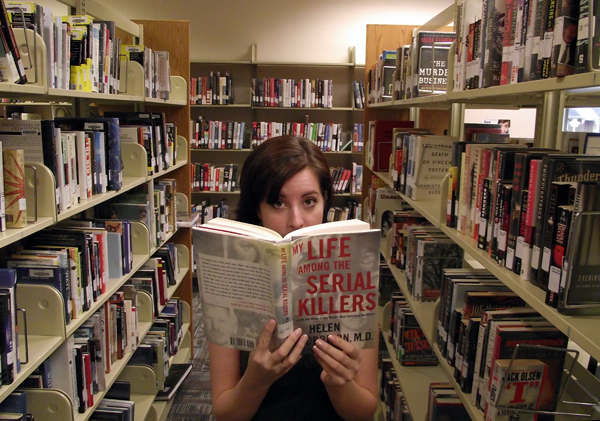 After finding out about some of the more well-known serial killers, I searched for books at the library. I was thankful that the Plainfield-Guilford Township Public Library had a large true crime section. I checked out the book My Life Among the Serial Killers by Helen Morrison, M.D. The book is written by a forensic psychiatrist who interviewed and profiled more than eighty serial killers, all the way from John Wayne Gacy, to Ed Gein to Richard Macek. I was chilled by the stories I read, but also strangely pulled in. It was difficult for me to believe that we walk this earth with people who are capable of such horrible actions. After my speech I found myself continuing to read books and do research on serial killers. Last year I read Erik Laron’s Devil in the White City, a novel about the infamous serial killer H. H. Holmes who killed dozens of fairgoers during Chicago’s 1893 World Fair. Recently I read I, Monster by Tom Philbin. This book is by far the most unnerving book about serial killers I have read, as nearly all of it is pieces of writing from actual serial killers. At one point while reading the book I hid it in my car while I slept at night. It really shook me up. Now, just to set the record straight: I read other things besides books about serial killers. I am a non-fiction fan, so true life stories are always calling my name. Several people know about my strange serial killer curiosity and joke about it with me. I am sure I am not the only person on this earth who finds this topic interesting. What is something you have an odd curiosity about? Please share them with us in the comments below! My relationship with the Plainfield-Guilford Township Public Library began before I was born. My mother, Susan Miller Carter, began working at the library in the 1970s. When I was born in 1985, my baby shower was attended by library staff, including the then library director, Mary McMillan. 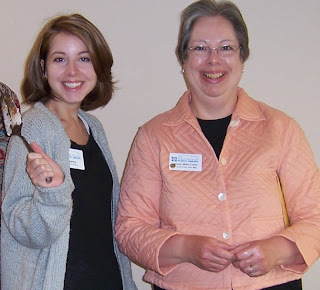 I grew up coming to the library on a more than regular basis – checking out books and videos, wandering in the staff only areas, and visiting with my favorite library employee, Jan Owens. As I entered middle school I came to the library after school with my friends and did “homework”. We mostly giggled and ate snacks, really. The library was a wonderful place for us to relax and socialize with a reasonable amount of freedom and independence. I began working at the Plainfield-Guilford Township Public Library on May 23, 2001. I was sixteen and a sophomore in high school. After school I would trek up Hobb’s hill to the library where I would begin my shift at 3:00 pm in the Children’s Room. Being a library page meant sorting and shelving returned materials, as well as tidying up the shelves. I loved my job and continued to work part-time throughout my high school and college career. After graduating from Marian College in 2007 I began working full time in the Youth Services Department. I did programming for children of all ages – my favorite being my Bookie Boogie Woogie, a program series for toddlers. We read books, sang songs and danced along to lots of fun music – it was a blast! 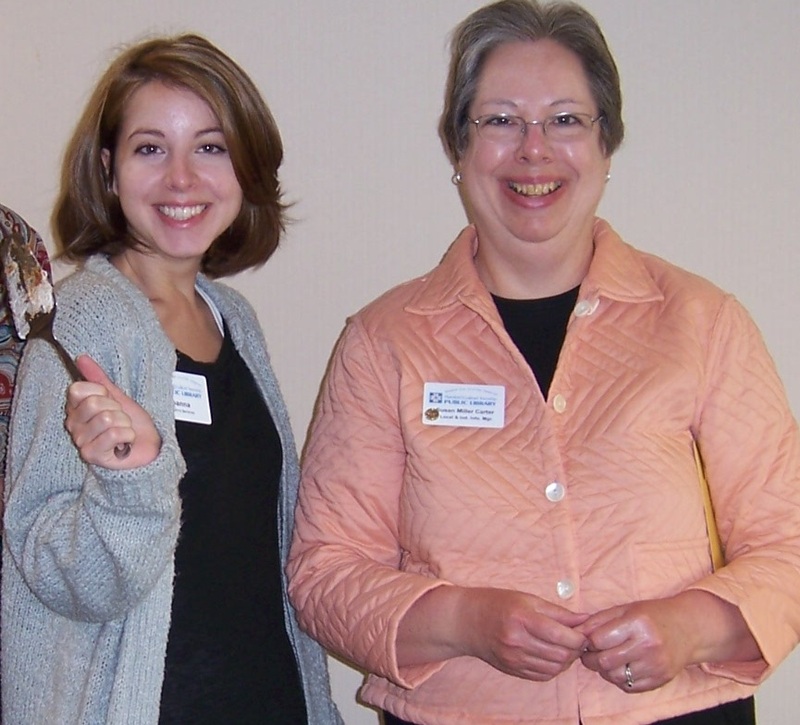 In 2009 I moved to the Community Central Department, which focuses on adult programming, community outreach, advocacy and marketing for the library. This move was a big change, moving from the Children’s Room to Community Central, but I felt right at home right away. Now I get to go out into the community and let people know what their library has to offer beyond “just books”. It is a wonderful job and I love it!